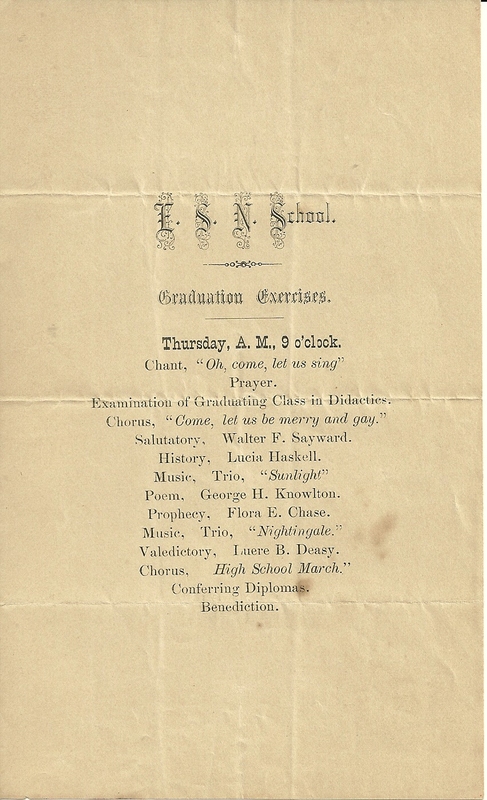 Graduation Exercises for the Class of 1881 at Eastern State Normal School, Castine, Maine, listing Walter Freeman Sayward as the Salutatorian. Walter Freeman Sayward was born 8 May 1856 at South Thomaston, Maine, the son of William H. and Mary Ann (Merriam) Sayward, who settled at Thorndike, Maine, where Walter grew up. His paternal grandparents were Joseph and Martha (Wheeler) Sayward. His maternal grandparents were Matthew Thatcher Merriam and wife Abigail (Smith) Merriam. Walter married Ellen Waldron Farrar, who was born in February of 1861 in Maine, the daughter of William T. and Celissa Brown (Ness) Farrar of Lincolnville, Maine. Her paternal grandparents were Sands and Elizabeth (Locke) Farrar. Her maternal grandparents were Randlett Ness (son of Marc Antoine LaPierre LaJeunesse and Sarah (Randlett) LaPierre La Jeunesse) and wife Betsey Wing (Hawes) Ness. From what I could find in the Censuses, Walter appears to have pursued his teaching career in Massachusetts, though the 1930 Census finds him, his wife Ellen and daughter Marion in Lyndhurst, Ohio, where he has apparently retired. For more information, see the page for Walter Freeman Sayward and Ellen Waldron (Farrar) Sayward at the Maine & Maritime Canada Genealogy network. 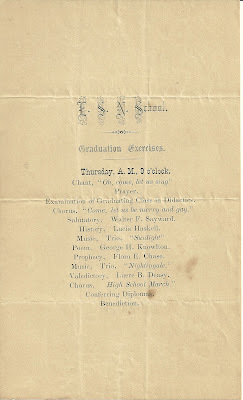 See scans of all the pages of the catalog of Eastern State Normal School for the year ending June 3, 1881. The catalog contains names and home towns of trustees, faculty and students. Do you know who the parents of Sarah Randlett would have been? There are so many Ranlett, Randlet, Randlett families and just as many daughters with the name Sarah. No, sorry I don't, but from a brief look-see, I can see your dilemma! On Family Search, her son is indexed as Randlet; take it for what it's worth. If you haven't already, you might want to visit Taconnett Falls Genealogy Library at Winslow, Maine - they have many genealogies that were bequeathed to them, and they're not indexed or online but are in alpha order by main line. http://www.facebook.com/pages/Taconnett-Falls-Genealogical-Library/168467003234582?fref=ts. They are or will shortly be on winter hours, open only on Saturday afternoons from 1-4 - dress warmly! (New members and donations to heating fund are most welcome!) BTW, there's a Marc Antoine Lapierre mentioned in the Drouin records as baptised at Repentigny QC but on actually reading it, it looks more like Marie.